My legs are begging me to stop biking, but my grumbling stomach urges me to continue pedaling. A large dragon art-car blasting heavy bass electronic music toots a fiery hello. I yell over the roar of their music, “ HAVE YOU SEEN A 40s DINER ANYWHERE?” Two people dressed up like pirates shake their heads, while the other dozen dancing souls gyrate in their own worlds. As the dragon glides away I assess my desert surroundings in the pre-dawn darkness. A speckled ocean of glowing lights bobs and twirls as I feel the air pulse from the hundreds of speakers playing various types of electronic music. 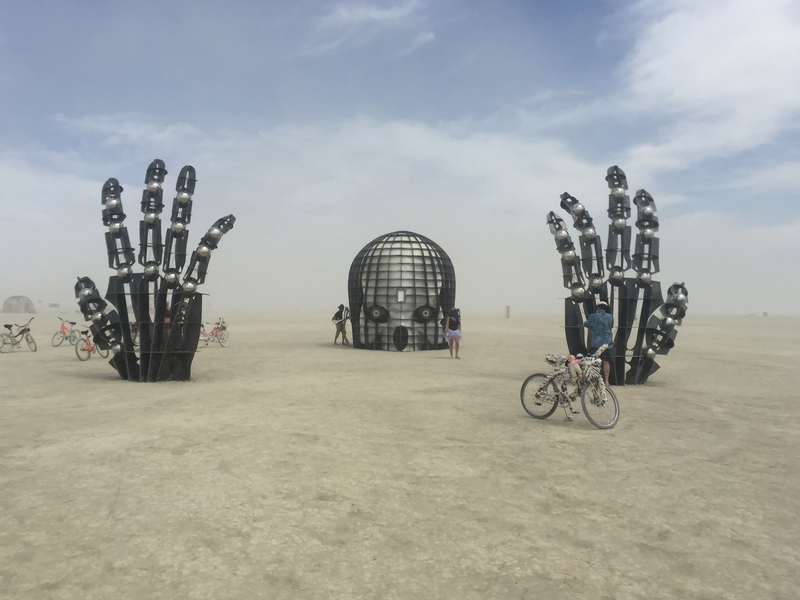 It is my third year at Burning Man, the annual weeklong art festival in Black Rock Desert, Nevada. I try and summon some “playa magic” to help me find the Dust City Diner art car that is hiding somewhere in the expansive desert and serving up grilled cheese and hot coffee. My hunger and curiosity are still fueling this solo middle of the night wild goose chase. 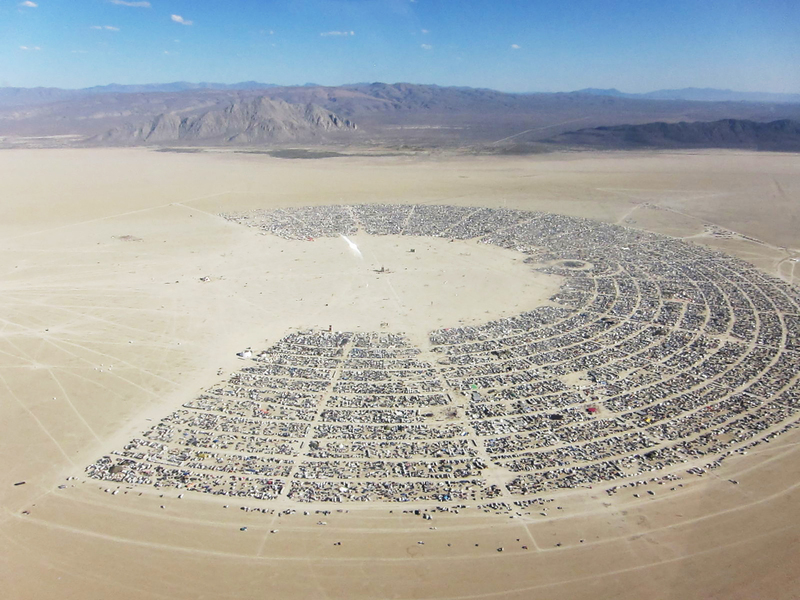 In the temporary city of Burning Man, theme camps are situated at numerical coordinates of avenues that extend radially from the Man sculpture at the 12 o’clock position and concentrically arcing streets that are organized alphabetically. 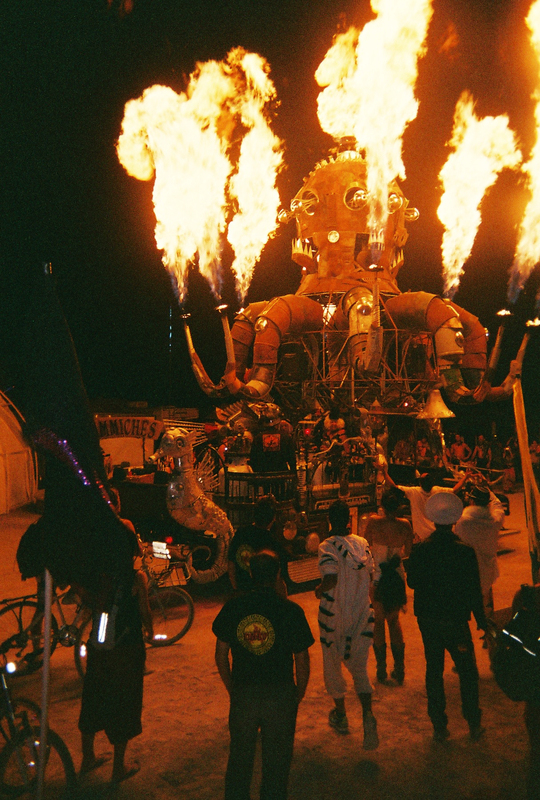 Beyond the Man is considered “deep playa” where synchronicity rules, art cars roam and burners on bikes weave around art installations. About two miles from the man, a plastic “trash fence” marks the boundary of the event. 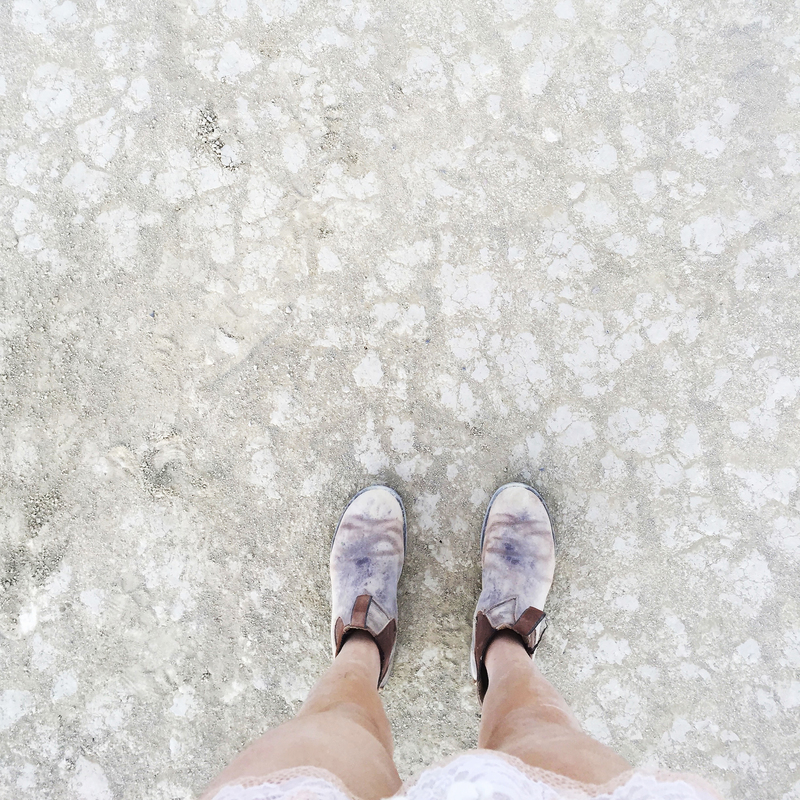 While all of Burning Man can be considered a string of unexpected surprises, I feel like the deep playa is where the some of the richest magic happens, as well as some of the deepest frustration and disappointment. After another unsuccessful 45 minutes searching for the Dust City Diner, I head back to my camp with my head hung heavy to get a few hours of sleep before sunrise. Back at camp, I plop down on a couch that coughs up a plume of dust and devour a granola bar and a squeeze pack of maple-flavored almond butter to quiet my grumbling belly. My alarm starts beeping at 6:30am and I crawl out of my sleeping bag, put on a tutu and some sunscreen and head out for the day. 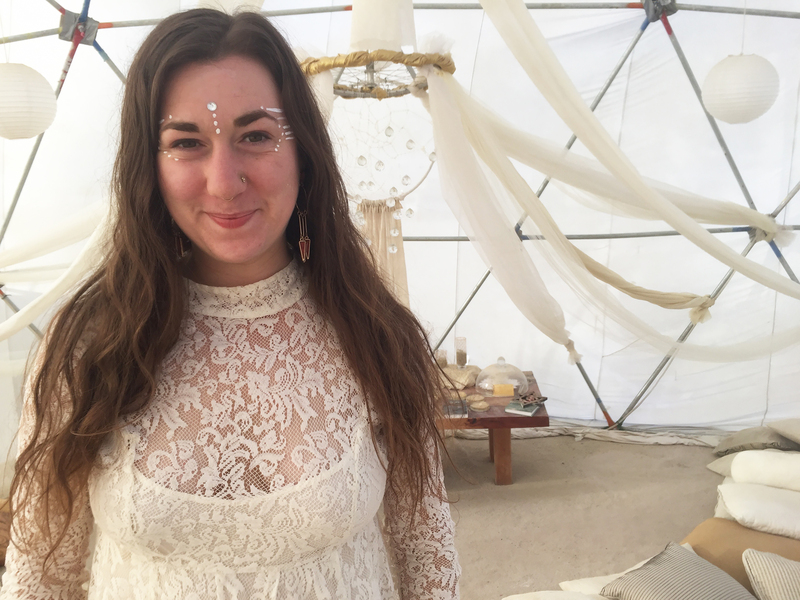 If you have never been to Burning Man, then bringing food and water for an entire week in the desert may seem like an impossible and unappetizing feat. 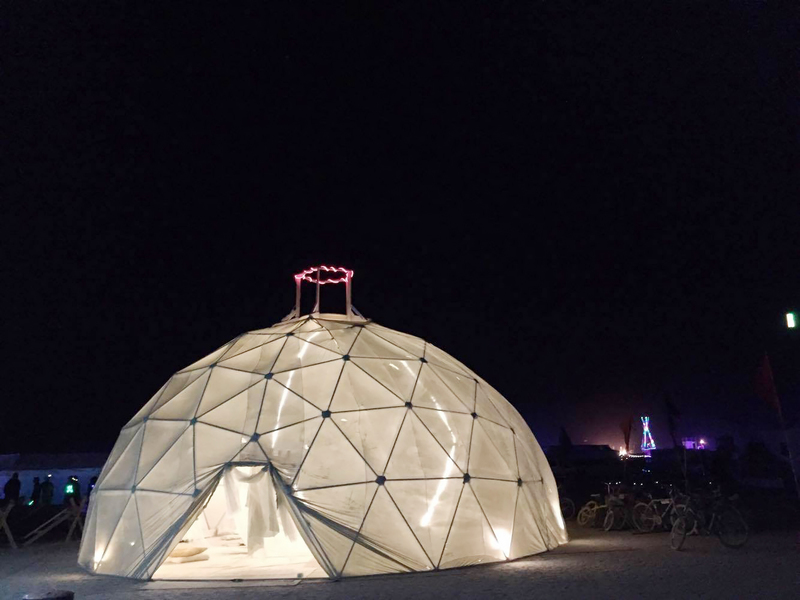 The food at Burning Man, however, is so much more than cup-o-noodles, beef jerky and trail mix. 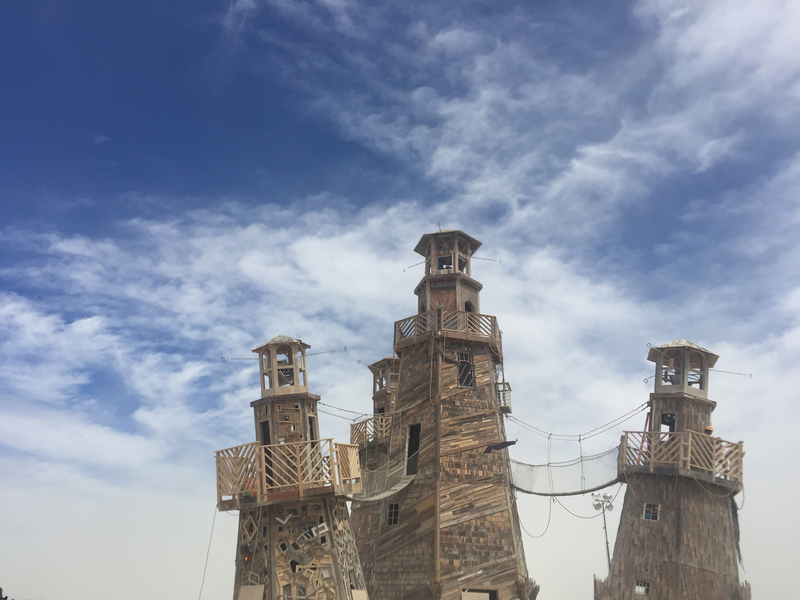 Exploring the animated city, you’ll find various food-themed camps that embody the second of ten guiding principles of Burning Man –- that of gifting -- by providing nourishment for any burner who happens by their camp. Some camps entice you with skimpily dressed megaphone hecklers, while others simply draw you in with colorful signs and the promise of sitting in the shade. One afternoon outing with my campmate Andrea, we happen upon a camp called “WeScream” that was serving ice cream made with liquid nitrogen. 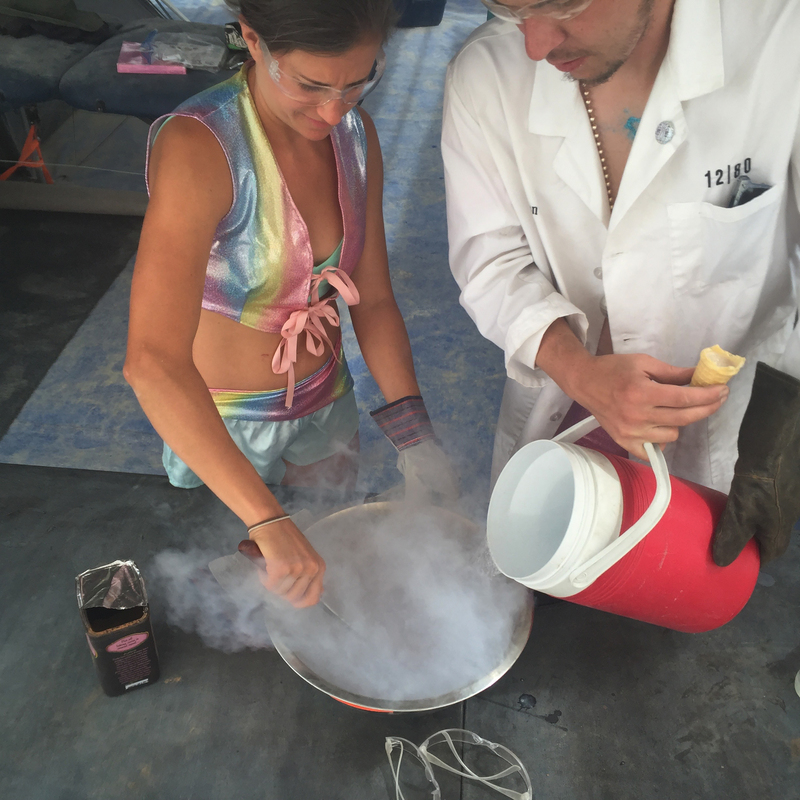 I got to take a turn stirring in the liquid nitrogen that smoked like a witch’s cauldron and we both got scoops of chocolate mint ice cream made with coconut milk in waffle cones. 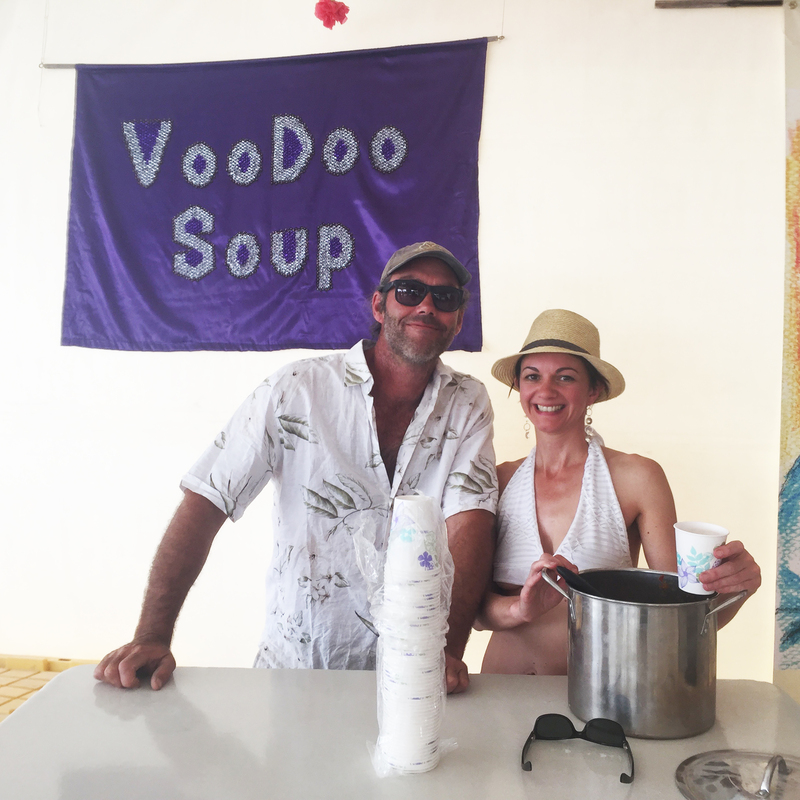 After our dessert we headed to my friend’s camp, “VooDoo Soup” that serves gourmet soups and homemade ginger beer daily with a side of live jazz music. We sipped a cooling tomato-lime gazpacho and listened to an older man with a long beard wearing a flamingo hat play the piano. Burners can also enjoy miso soup and sake from the camp, "Miso Horny," which also provides various consent workshops. The best snow cone can be found at "Snow Koan Solar," which uses giant solar panels to dish out a rainbow of flavored snow cones. You can also spin a wheel of compromising dares to receive a pickle from one of many pickle themed camps. Besides all the fun playa snacks I enjoyed while peddling around the city on my bike, possibly the only regular daily activity I partook in was the shared breakfast and dinner with my 65 person themed camp, "Milk and Honey." We had a large kitchen structure that housed two waist-high portable gas stoves, three commercial chest freezers and a pantry full of dried goods. Each person in our camp worked one breakfast and one dinner shift. 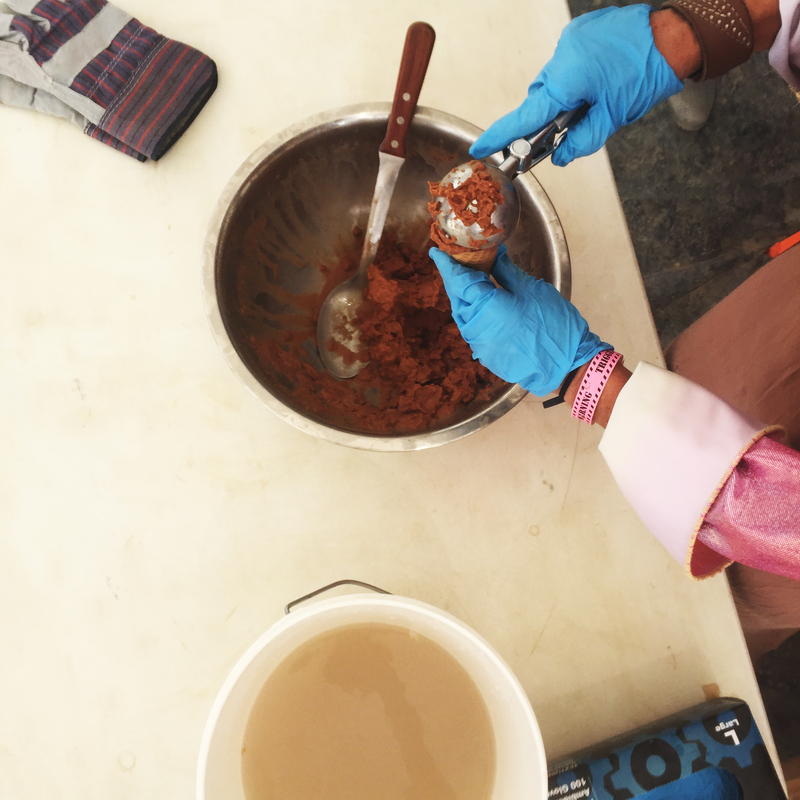 Detailed recipes were inscribed on organized spreadsheets and with a pinch of playa dust we enjoyed blueberry pancakes, quesadillas, spinach salad, lentils and quinoa, chicken apple sausages and much more. 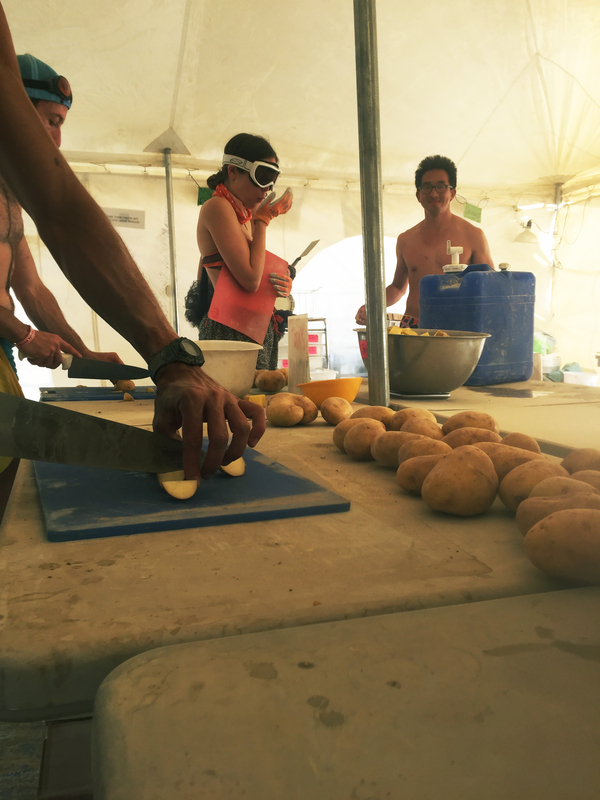 One of the most exciting things that was cooking in the kitchen this year was our partnership with a Nevada-based camp that provided organic and local produce and delivered to various camps on the playa at reasonable prices. 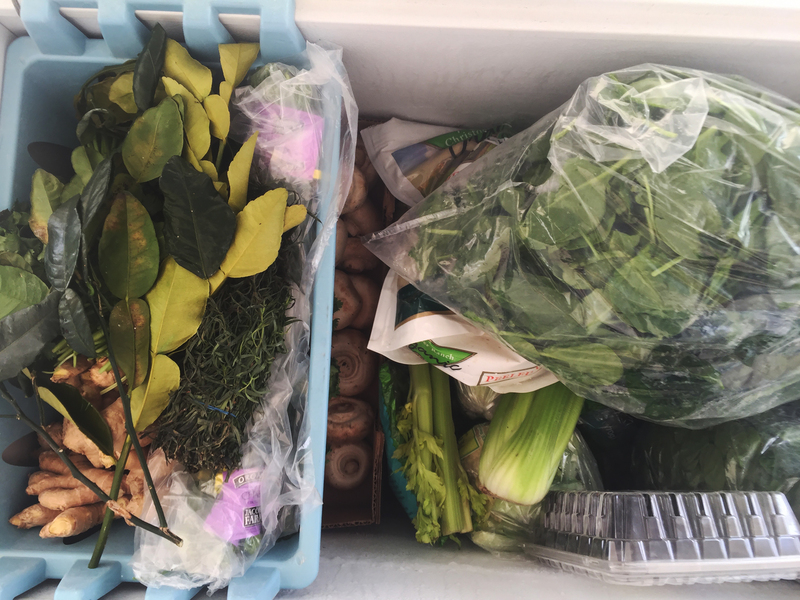 We got 80% of our food from this camp and had many more organic veggies than we’ve had in past years. It felt sweet and grounding to share meals with friends while hearing about the day’s (or evening’s) escapades. Milk and Honey is a “Jew-ish” camp and includes a mix of 50/50 Jewish to non-Jewish participants, but has no religious expectations or requirements. 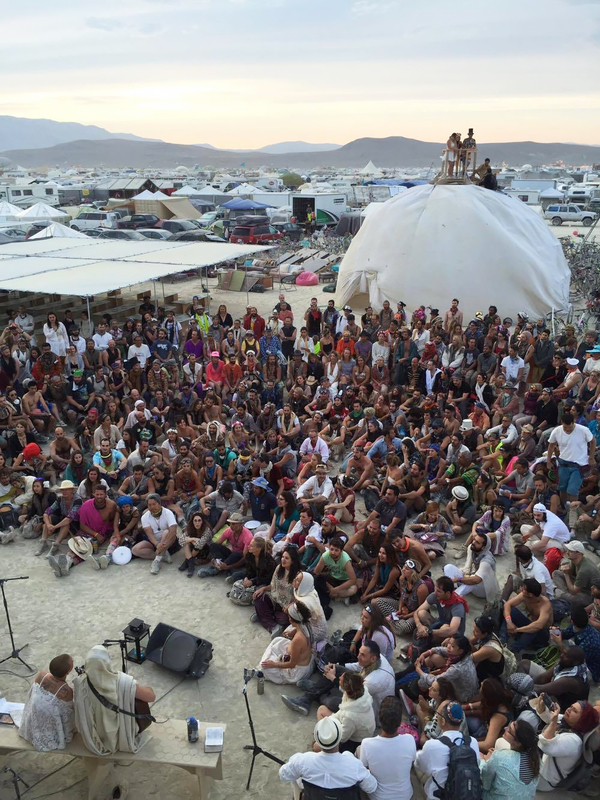 Our gift to the playa every year is a “radically inclusive” (principle #1 of Burning Man) Shabbat service and dinner on Friday night. Members from camp spend all day cooking a vegetarian feast of lentils, orzo, cabbage salad and couscous for the Shabbat attendees (and all year fundraising and planning on how we can make next year’s Shabbat even better). This year a record number of over 600 people showed up for the Friday night celebration. Burners sat down at long tables on the floor of our living room shade structure as Milk and Honey camp members served everyone wine, challah and the smorgasbord of food. Putting on Shabbat for that many people takes an incredible amount of work, organization, funding and planning from cooking, serving, facilitating, and parking bikes to cleaning up. During the service, I climb to the top of our geodesic dome and look down at the sea of people singing and swaying together. 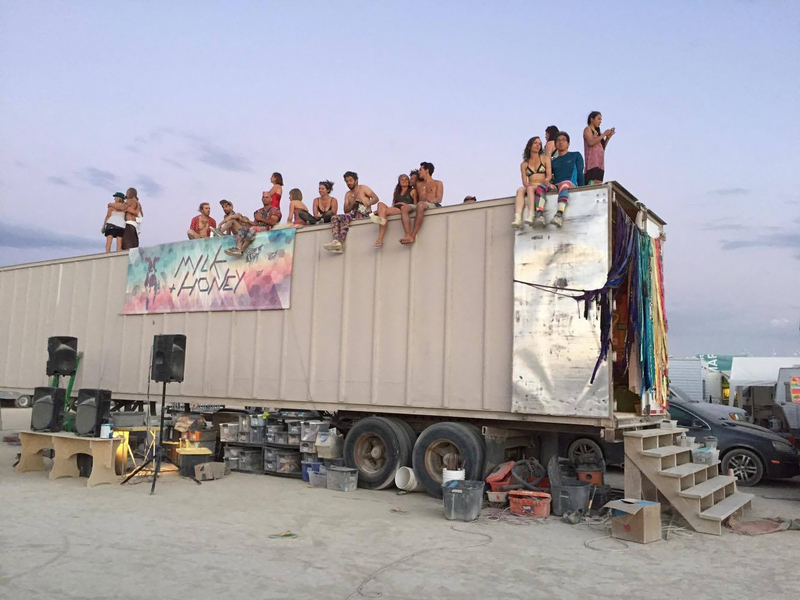 Even though I developed an agenda at Burning Man to find “this” art car or get to “that event,” it is the unexpected moments that make my heart feel full and truly believe in the playa magic that we will all somehow get what we need.